That Kick, Those Boots! 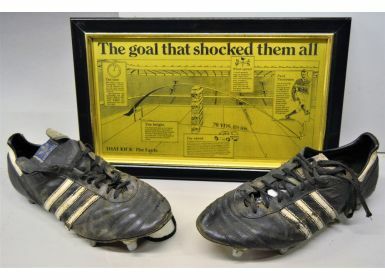 The Adidas match worn boots by record distance-kicker Paul Thorburn, Wales v Scotland, 1986: Paul holds the record for the longest successful kick in an international test match (although not the longest in Rugby Union as a whole). He gained the record during the 1986 Five Nations Championship at Cardiff Arms Park with a penalty kick measuring exactly 70 yards 8.5 inches (64.2m) against Scotland. 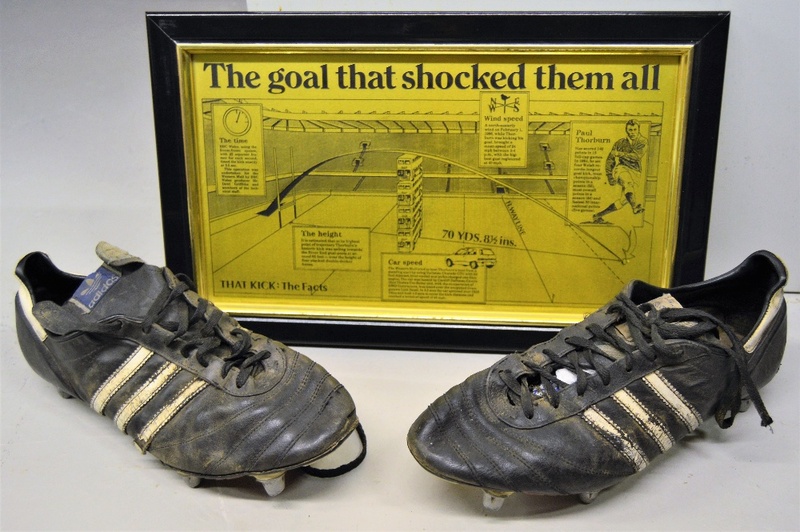 He has kindly donated the famous footwear and a framed copper copy of the Western Mail's printing block of their graphic illustrating the successful superstrike. Very desirable and historic memorabilia for an entirely worthwhile cause - the Trust set up by the admirable ex-Scottish lock Doddie Weir in aid of research into motor neurone disease from which he is suffering.